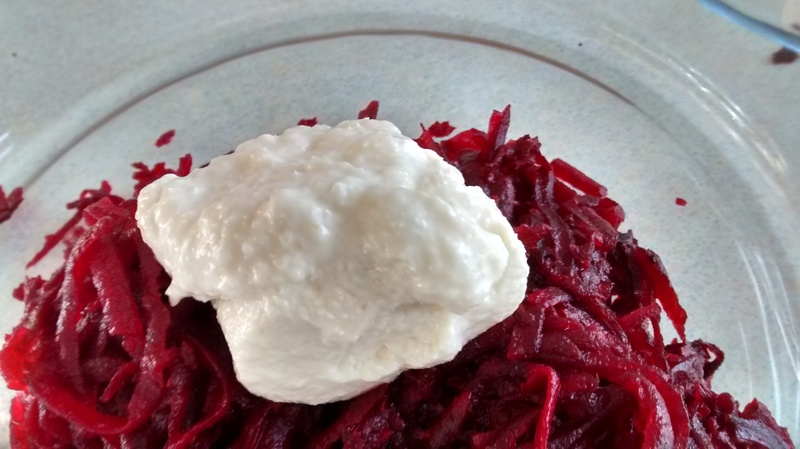 Beetroot is a very popular vegetable in Poland and is served both hot and cold and is the main ingredients of barszcz (The classic Polish beetroot soup). Now this may just my imagination but the beetroot in Poland just tastes so much better than the ones I have had in England, maybe it is the variety that is grown there or the soil. I think you have to use home-grown or organic beetroot to get as good a taste. 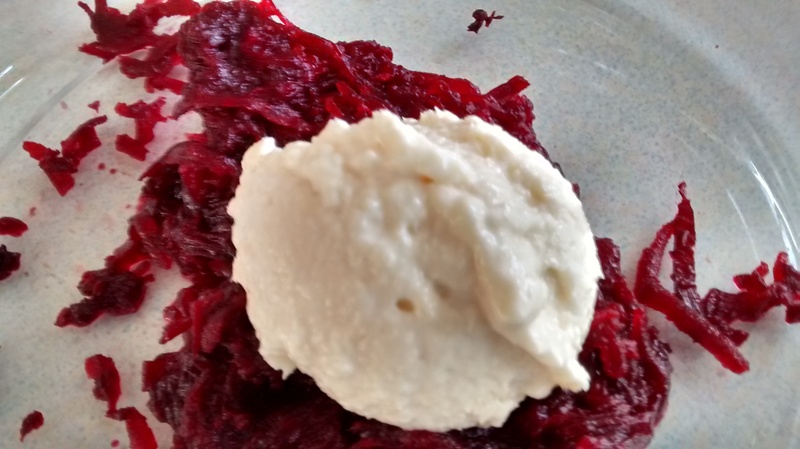 In the following recipes I have used vacuum packed boiled beetroots – boiling or roasting raw beetroot should give a better flavour but when you only want to make a small amount or you have little time this will work as well especially if you adjust the flavour with lemon juice or a little sugar. A popular variant is something called botwinka – this is very young beetroot – sold in bunches (rather like radishes) and consists of the small “bulb” and the young green leaves, which are all used. As I have not seen this for sale in England I will not be including any recipes – but if you are ever in a position to try this (often in the form of a soup) you will taste something very delicious. Ćwikła is the most typical Polish accompaniment to roasted and smoked meats and sausage. 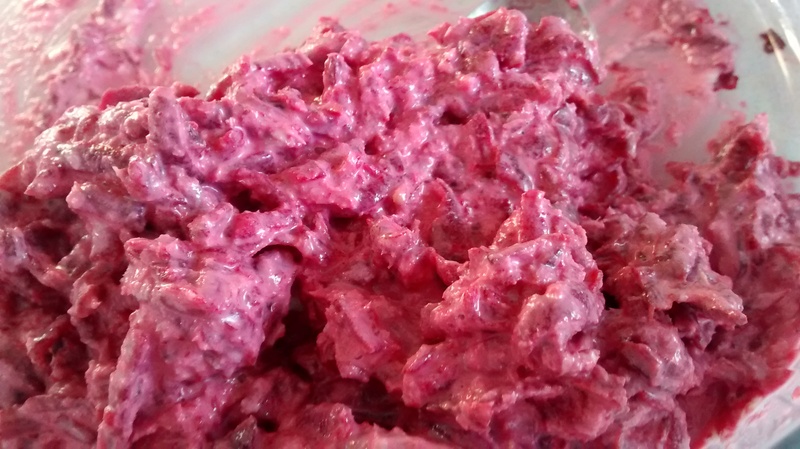 This salad or relish is made from grated cooked beetroot which is mixed with grated horseradish – chrzan. The first recorded recipe for ćwikła comes from the writings of Mikołaj Rej (1505 – 1569) who is known as the “Father of Polish Literature”. He was the first person to write exclusively in Polish. He was born 59 years before Shakespeare (1564 – 1616). Grate the beetroots using a fine or medium grater and put this into a bowl. In the past I always used a fine grater but now I prefer to use my medium grater. Add a large dollop or two of horseradish sauce. Below are two kinds, one with soured cream and one without. I like the one with soured cream more. A few years ago I thought it would be a good idea to grow my own horseradish – that was a mistake! It starts to take over with the roots spreading underground. However the dark leaves are very attractive and the air does smell of horseradish when you walk up to it. You just need to be able to contain it. 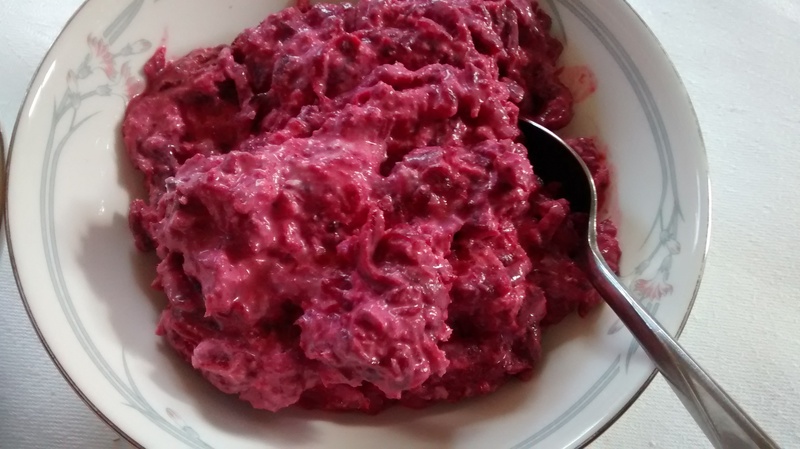 Mix the grated beetroot and horseradish sauce together. Add soured cream – if using the sauce with this in already you might not need as much. You can add lemon juice as well. 1 eating apple with a good flavour such as Jazz, Braeburn or Pink Lady. 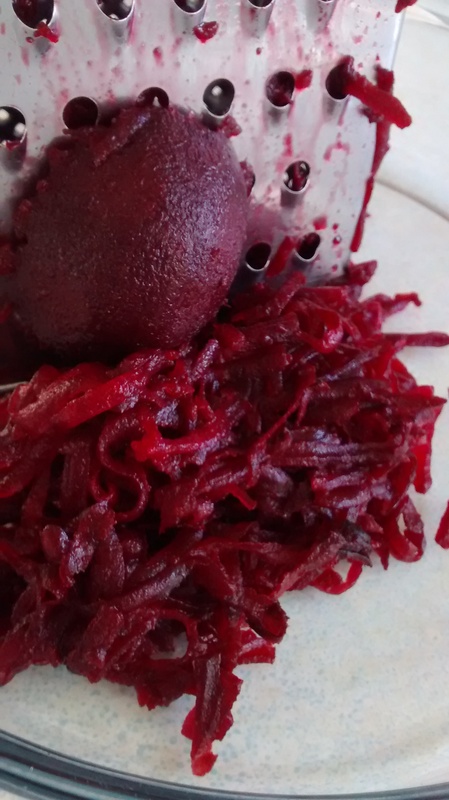 Grate the beetroots using a medium grater. Peel and core the apple and grate this using a medium grater. You can add some extra sugar to taste. This tastes much better if it is left so all the ingredients mingle together for a few hours. I make this in the morning if I want it for the evening or I make it the night before for lunch time the next day. This is a delicious way of serving beetroot warm with a roast dinner. Grate the beetroots using a medium grater and put them into a saucepan with the lemon juice and a little water. 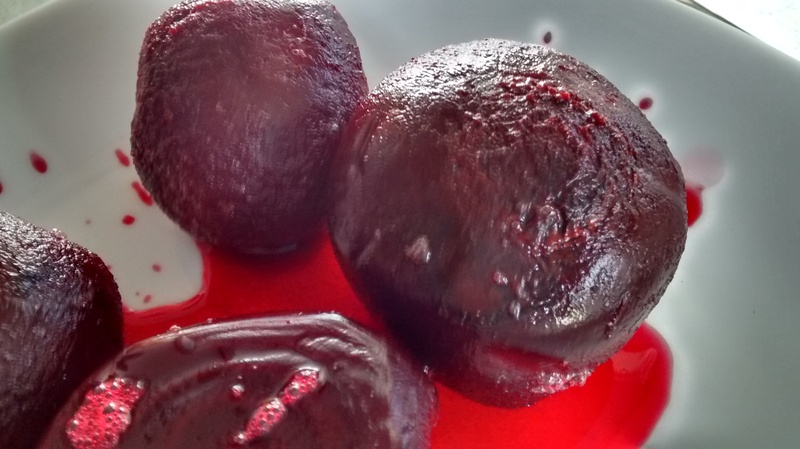 Put a lid on the saucepan and gently simmer the beetroot – taking care not to let it dry out or burn. Melt the butter in a small frying pan and add the flour – let it colour slightly. Add 2 tablespoons of soured cream and a little water and combine this well. Add this mixture to the simmering beetroots, once again combining well. Let this simmer for 5 to 10 minutes – keep checking, and stirring and adding more soured cream, lemon juice or water if it looks like it is going to dry out. Add salt & pepper and a little sugar to taste. Serving dish is Topic designed by Alan Rogers in 1967 for J & G Meakin.